The glaze for this glazed carrots recipe is produced by reducing a mixture of chicken stock, butter, and sugar until it's thick and syrupy. You could also use ​veal stock. Some good suggestions for what herbs to use would be fresh mint, thyme, oregano, tarragon, or parsley. This glazed carrots recipe is perfect for serving with roasted chicken or turkey. It's generally a good idea not to add salt to a dish until right before serving it, and this recipe is a perfect case for why. Since the cooking liquid (the stock) will be reduced to a thick syrup, adding salt too early will only concentrate the saltiness. Salting at the end ensures that the salt doesn't overpower the dish. Warm a heavy bottomed pan over medium heat. Add the butter, and when it liquefies add the carrots. Cook about 3 minutes, stirring occasionally. Add the stock and the sugar. Cover the pan and reduce heat to low. Cook another 5 minutes or until the carrots are almost tender. 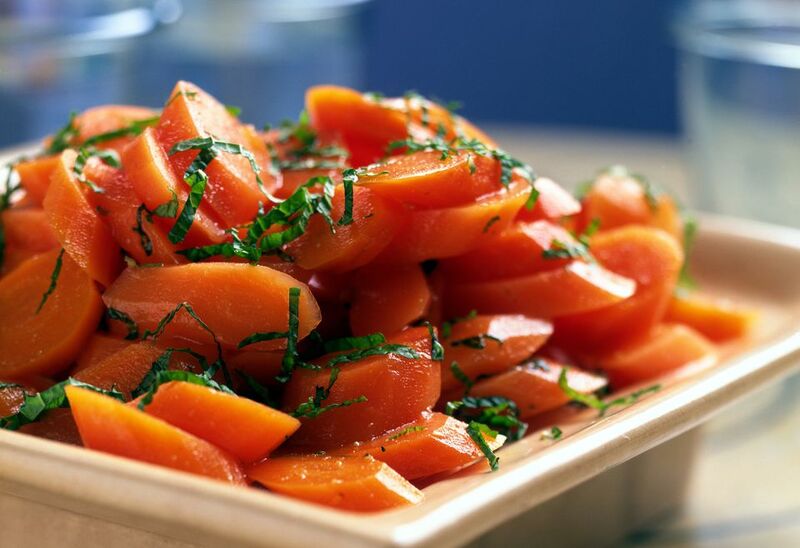 Use a slotted spoon to remove carrots and set them aside. Cover the pan and continue cooking the liquid until it has reduced to a thick, syrupy consistency. Return the carrots to the pan along with the fresh herbs and cook until the carrots are tender and nicely coated with the glaze. Season with kosher salt and freshly ground black pepper and serve right away.